LONDON (AP) — The company at the center of the Facebook privacy scandal, political consultancy Cambridge Analytica, is going out of business. But that doesn't mean those behind the entity will escape the scrutiny of regulators. As authorities continue to investigate the use of the data of millions of people, here's a look at what the bankruptcy filings in the U.K. and U.S. mean for the probe. Facebook is introducing the new policies this week in Europe, but eventually everyone on the social network will be asked to decide whether they want to enable features like facial recognition and some types of targeted advertising, the company said in a blog post. NEW YORK (AP) — If you want to tailor a Facebook ad to a single user out of its universe of 2.2 billion, you could. EU Justice Commissioner Vera Jourova had a phone exchange with Facebook COO Sheryl Sandberg and said on Friday that Zuckerberg should act on the Parliament's invitation to come explain the situation. WASHINGTON (AP) — Facebook CEO Mark Zuckerberg acknowledged that regulation of social media companies is "inevitable" and disclosed that his own personal information has been compromised by malicious outsiders. But after two days of congressional testimony, what seemed clear was how little Congress seems to know about Facebook, much less what to do about it. NEW YORK (AP) — Mark Zuckerberg has faced two days of grilling before House and Senate committees to address Facebook's privacy issues and the need for more regulation for the social media site. WASHINGTON (AP) — Here's what Facebook CEO Mark Zuckerberg wanted members of Congress to know about the scandal in which Cambridge Analytica used the massive social platform to access 87 million users: He made mistakes. Facebook's mission is to "help people connect." And no, he's not resigning. NEW YORK (AP) — Mark Zuckerberg insisted once again Tuesday that Facebook doesn't sell your data, calling it a common misconception people have about Facebook. Here's a look at his remarks. NEW YORK (AP) — Yes, Mark Zuckerberg will wear a suit. NEW YORK (AP) — Facebook said it would begin notifying users Monday if their data has been swept up in the Cambridge Analytica scandal, although it appears to be taking its time. 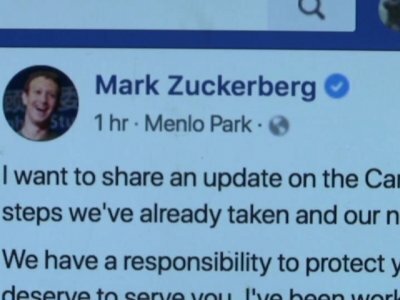 WASHINGTON (AP) — Facebook CEO Mark Zuckerberg will apologize for his company's role in a data privacy scandal and foreign interference in the 2016 elections when he appears before Congress this week, saying the social network "didn't take a broad enough view of our responsibility," according to prepared remarks released Monday. SAN FRANCISCO (AP) — Congress has plenty of questions for Facebook CEO Mark Zuckerberg, who will testify on Capitol Hill Tuesday and Wednesday about the company's ongoing data-privacy scandal and how it failed to guard against other abuses of its service. NEW YORK (AP) — Now that Mark Zuckerberg is set to testify before Congress, he'll need to seek advice not just from lawyers but also from communications specialists on addressing Facebook's privacy fiasco. Public-relations experts who have prepped CEOs before say that congressional hearings are more political theater than public policy. The so-called "optics" — how things look — are as important as what you say. MENLO PARK, Calif. (AP) — "We've made a bunch of mistakes." ''Everyone needs complete control over who they share with at all times." ''Not one day goes by when I don't think about what it means for us to be the stewards of this community and their trust." Sound familiar? It's Facebook CEO Mark Zuckerberg addressing a major privacy breach — seven years ago . NEW YORK (AP) — The author of a provocative Facebook memo declaring that growth is justified even if it costs lives says he doesn't actually agree with the memo and wrote it to provoke debate. NEW DELHI (AP) — India's government has sent a notice to Facebook asking whether the personal data of Indian voters and users has been compromised by U.K.-based Cambridge Analytica or any other downstream entity. WELLINGTON, New Zealand (AP) — New Zealand's privacy commissioner said Wednesday that Facebook broke the law by not releasing information to a man who wanted to know what others were saying about him on the social network. NEW YORK (AP) — To get an idea of the data Facebook collects about you, just ask for it. You'll get a file with every photo and comment you've posted, all the ads you've clicked on, stuff you've liked and searched for and everyone you've friended — and unfriended — over the years. This trove of data is used to decide which ads to show you. It also makes using Facebook more seamless and enjoyable — say, by determining which posts to emphasize in your feed, or reminding you of friends' birthdays. NEW YORK (AP) — Wondering why Facebook seems to be taking baby steps to address the biggest scandal in its history? Stronger safeguards on user data might damage Facebook's core business of using what it knows about you to sell ads that target your interests. WASHINGTON (AP) — The leaders of a key House committee declared Thursday that Facebook officials failed to answers questions about a privacy scandal involving a Trump-connected data-mining company, and they want CEO Mark Zuckerberg to testify before the panel. Reps. Greg Walden of Oregon and Frank Pallone of New Jersey said in a brief statement that the "latest revelations regarding Facebook's use and security of user data raise many serious consumer protection concerns." But it's far from clear whether he's won over U.S. and European authorities, much less the broader public whose status updates provide Facebook with an endless stream of data it uses to sell targeted ads. Authorities in the U.S. and the U.K. are bearing down on Facebook and political data-mining firm Cambridge Analytica over allegations the firm stole data from 50 million Facebook users and used it to manipulate elections.